In the seeming tranquillity of Regency Square in Cheltenham live the diverse inhabitants of its ten houses. One summer’s evening, the square’s rivalries and allegiances are disrupted by a sudden and unusual death ‘“ an arrow to the head, shot through an open window at no. 6. The Cheltenham Square Murder is a classic example of how John Bude builds a drama within a very specific location. Here the Regency splendour of Cheltenham provides the perfect setting for a story in which appearances are certainly deceiving. 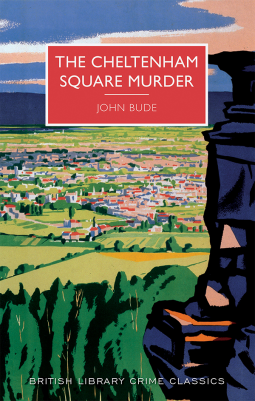 The Cheltenham Square Murder by John Bude was first published in 1937. Previously I’ve read John Bude’s second book- The Lake District Murder, a police procedural, showing in intricate detail how detectives investigated a crime, particularly in rural areas in the mid 1930s, in which I found his calculations of the times and distribution of petrol deliveries a bit difficult to follow. But by the time he wrote The Cheltenham Square Murder Bude’s style had become more refined and I found it much easier to follow, whilst still writing in detail about the suspects and how the crime could have been and was committed. It is quite complicated, a real puzzle to solve, first of all just how the murder was carried out and secondly who out of the several suspects was the murderer. There is a plan of the fictional Regency Square showing the layout of the ten houses and their occupants. Bude describes the residents giving a good idea of their personalities and relationships. As in all communities, they don’t all get on, ‘outwardly harmonious yet privately at loggerheads’. Those who belong to the Wellington Archery Club are keen, even fanatically keen archers, so immediately they are suspects. It is fortunate for the local police that Superintendent Meredith from the Sussex County Constabulary is staying in the Square and helps Inspector Long unravel the mystery, but not before another there is a second victim, again murdered with an arrow in the head. It’s a slow-paced mystery, both Meredith and Long spend much time working out how the murder was committed and Bude drops in several red herrings to confuse matters as first one then another of the residents comes under suspicion. I enjoyed trying to work it out, but although I had an idea about the guilty person I couldn’t see how the murders had been achieved until the method was revealed. Martin Edward’s introduction gives a brief biography of John Bude, whose real name was Ernest Carpenter Elmore (1901 – 1957). For a time he was a games master at St Christopher School in Letchworth where archery was one of the pupils’ activities. My thanks to the publishers, Poisoned Pen Press in association with the British Library, and NetGalley for my copy of this book which has an introduction by Martin Edwards. Oh good, I’m glad you enjoyed this one since it’s on my TBR and will be reaching the top soon. I’m enjoying all these vintage crime books – somehow I find them much more relaxing than modern crime novels. Bude really did do some solid whodunits, Margaret. He’s one of those Golden Age writers who don’t always get a lot of attention, but were certainly talented. Glad you enjoyed this one. I am pleased to hear you enjoyed this – I am so tempted by these lovely covers for the British Library Crime Classics, but sadly I am yet to read one! I’ve found these reprints to be a bit hit and miss so I’m glad that you enjoyed this one.